‘Pearl Creek’ was established in 1876 by the Bell family which they held till 1918 when Mckenzie Bros purchased the lease. ‘Pearl Creek’ is still held to the currant day by the decendants of this pioneering family. Pearl Creek currently runs 1600 Droughtmaster females on 9720 Hectares in the Duaringa district. It supports a mix of native spear and blue grass together with Buffel, Sabi, and stylo legumes on Blue gum and box flats and iron bark country. Wiliam Bell Snr, purchased the leasehold of Pearl Creek and moved there in 1876 shortly after his marriage to Emile Jane (nee Ariel) in Rockhampton in 1875. Pearl Creek like other holdings in the area covered a large area and was measure in square meters rather that acres – the western boundary of the property being the Dawson Range. The property comprised both open and heavily timbered country with the only fencing limited to near the homestead – one paddock for the horses and the other for the milking cow. 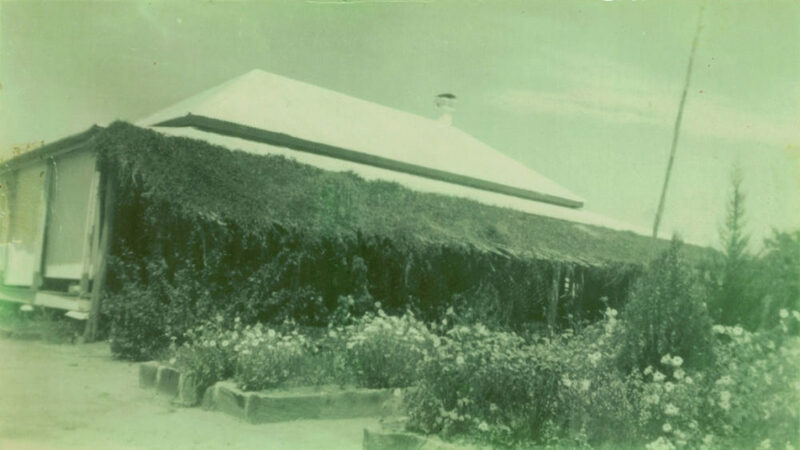 The first buildings were all of slab walls and stringy bark roofs but the main building had shingles for roofing. With no iron roofing, rain water was not available and so all water for domestic purposed had to be carted from the nearby creek. It is thought that the house as seen in the photograph was built in the 1880’s. Pearl Creek was watered by seven creeks, lagoons and swamps and the much of the timber, which consisted of iron bark and spotted gum was cut and used for railway sleepers as well as for props at the Mount Morgan mine. 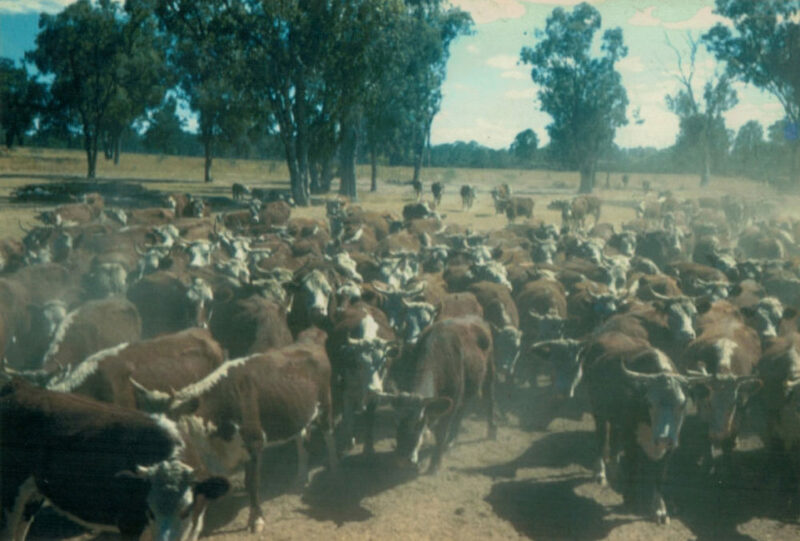 Cattle yards were built near each of the seven creeks to facilitate the yarding of cows and calves for branding. Needless to say, with the cattle enjoying vast open range grazing, they were wild animals making mustering and handling a difficult and dangerous task. The shire roads in those early days were pretty rough at the best of times and were no more than two wheel tracks meandering between trees. Some of the early settlers ran sheep, however this was a relatively short-lived industry in the area due to the problems with spear grass, foot-rot, etc. making way for the introduction of cattle. The cattle industry in those days was very different to today. In the early days of the industry, cattle were bred mainly for their hides and tallow and many of the properties had their own boiling-down facilities. The ‘fats’ were taken to the meat works where the meat was canned and shipped to England with some carcasses being sold locally. The cattle breed favored in the area in the early 1870’s was Shorthorn only being retained as house milkers. Between the years of 1875 to 1895 William and Emile Bell had ten children. They were renowned for their hospitality – often having five to seven unannounced travelers to dinner or stay over night. By 1898 William Bell Snr, had handed over management of the property to his second born son William (Earl) Ariel Bell, who in 1905 married Lilly White – the eldest daughter of William and Margaret White (re: Wooroona and Comet Downs). Earl and Lily had two children, Jack and Margaret and they lived on Pearl Creek until it was sold to the McKenzie Brothers in 1918. Margaret was to later marry Murray Gardener. 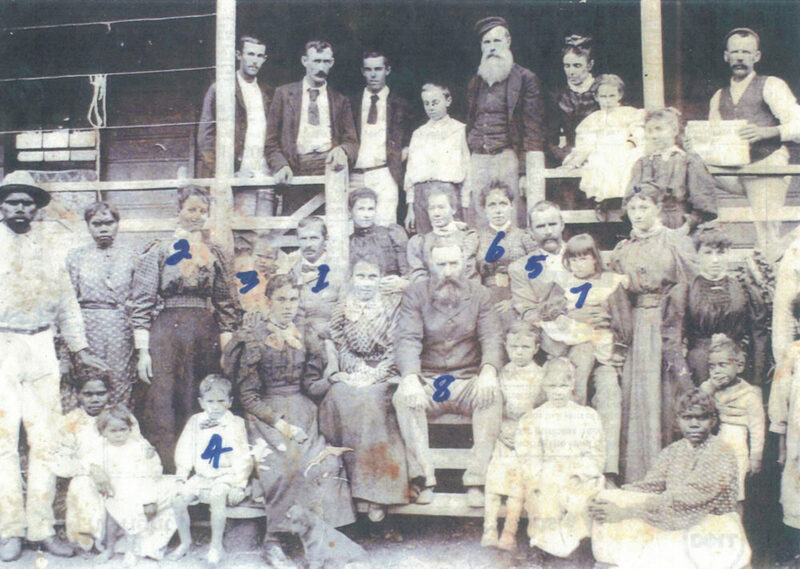 Following the sale of Pearl Creek, it is understood Earl, Lilly and their children moved to Rockhampton. The McKenzie brothers purchased the property from William Bell in 1918 it comprised some of 56,000 acres – Pearl Creek Station of 46,000 acres and adjoining on the southern boundary, ‘Ballynatlyn’ of 10,000 acres. 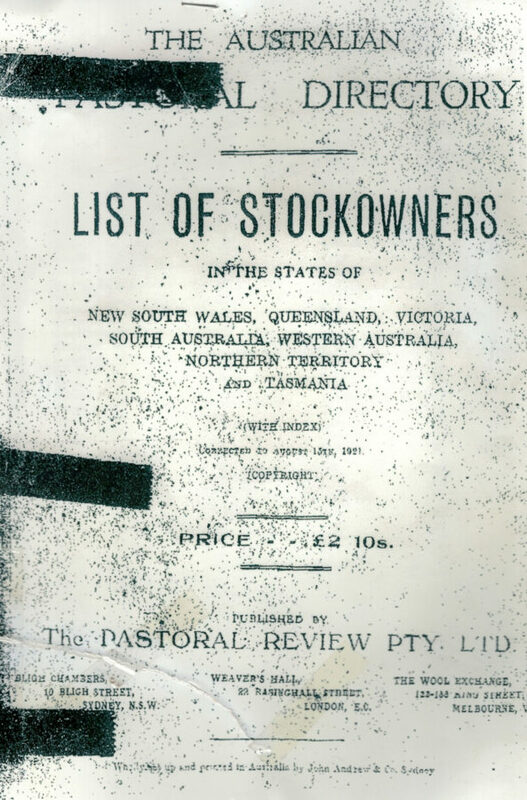 Given the longevity of the McKenzie family’s interest in Pearl Creek and also Bimbi (almost 100 years and 75 years respectively) as well as Yallara, Wild Horse Creek, Gainsford, Coolibah, Coolarah, Calioran, Melrose, Wabbler, Sharpers Creek and many other holdings, it is worth recording the growth of the McKenzie family and the role they played as innovators in the Queensland beef industry and in thoroughbred and horse racing in Central Queensland. William and Emile Bell and the rest of the family moved to their other holding Parkes Station which had been part of Coomooboolaroo and which adjoined Pearl Creek on the south west boundary. After the death of Mr William Bell, his third born son Jack continued to live on and work Parkes Station – now known as Parkes Holdings. Like the other holding in the area Pearl Creek had been subject to redemptions (e.g. 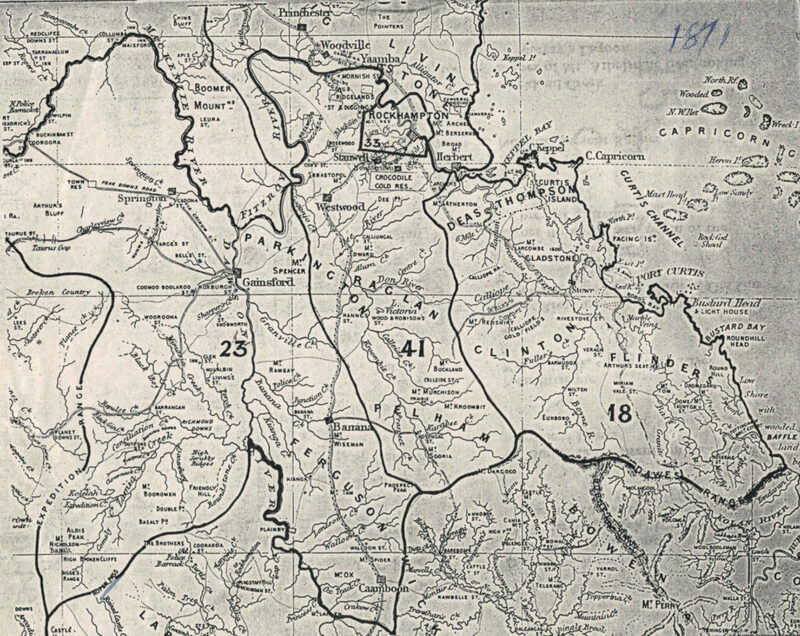 22,000 acres were resumed in the 1949/1950 period), with such lands being thrown open for selection. In 1862, John William McKenzie (1) and his wife Sarah and three children John William (2) [aged 17], James Wallace (1) [aged 11], and Jessie [aged 8]; migrated to Australia from Scotland aboard the sailing ship Elensleigh. 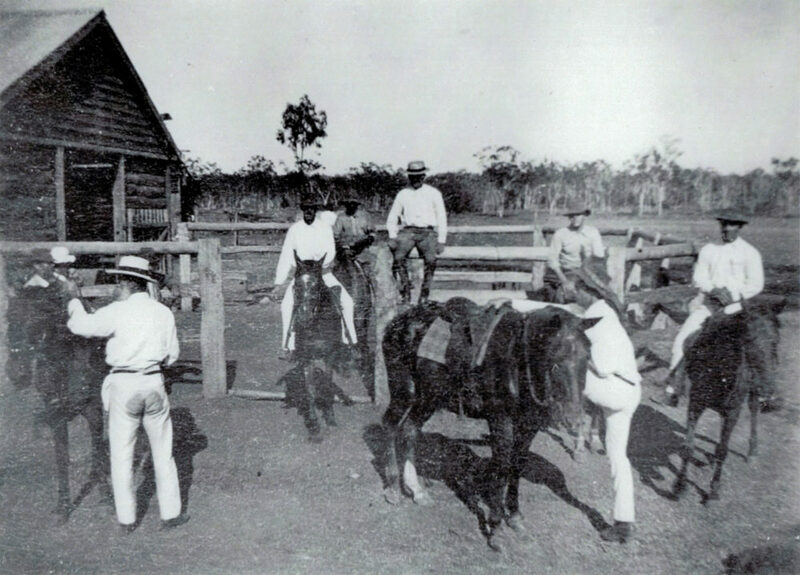 After disembarking at Morton Bay they settled in the Alton Downs district, north of Rockhampton. 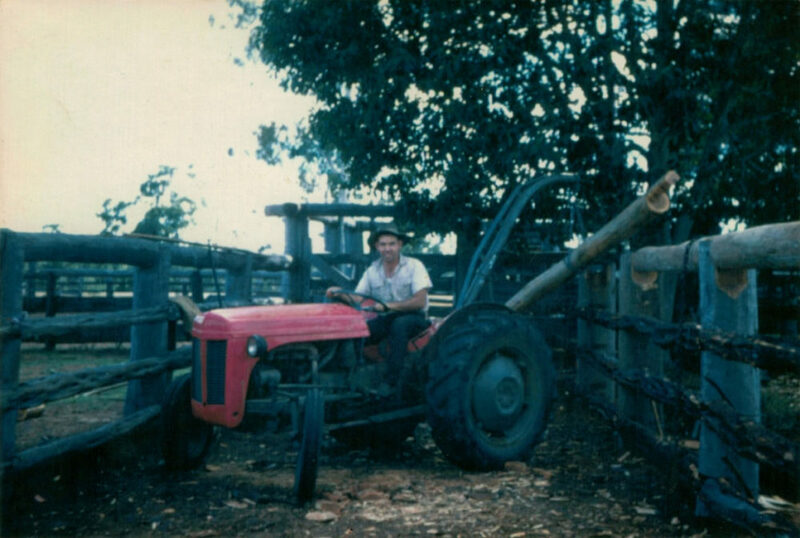 In 1863, John Snr., took up Campsie Hill, a 160 acre dairy farm on the Fitzroy River, which provided ready access for vessels to take produce to the port of Rockhampton. In 1866, John Snr., also purchased Calioran a 1,800 acre holding in the same Alton Downs area where a house was built on low blocks – (to be raised to higher blocks after the devastating flood of 1918). Also in 1918, the family purchased Coolarah. John William (2) married Mary Morrison of Kilkenny, and together they had five children. John William (2) died in 1890 aged 45 leaving Mary to raise their five children, the youngest just aged 1. The children of John and Mary were: John (Jack) William (3), Mary Ann, Flora, James Wallace (1a) and Donald. These four children were later to form the McKenzie Bros. partnership which purchased Pearl Creek – along with a number of other pastoral holdings. It would be Donald Bruce McKenzie that would take up a position in 1951 of employment at Pearl Creek, still managed by Jack Walsh, and in 1957 purchased the property from the partnership. In 1951 Donald Bruce McKenzie (1929 – ), the son of Donald McKenzie took up employment at Pearl Creek which was still under management by Jack Walsh. Also on the property was Jack Walsh’s son and daughter in law (who acted as cook) and the indigenous stockman, Paddy Mickelo. Bruce McKenzie describes Paddy as a man with the skin as black as midnight and a heart as white as the driven snow. Paddy was a member of the Gangulu tribe of the Dawson River area. Paddy’s parents well full blood aboriginals and his siblings were Stanley and Walloo. He was a single man and is reputed to have worked at Pearl Creek for 29 years. It is thought that Paddy was born around 1903 and as well as working as a stockman he worked as a police tracker in the 1930’s and 1950’s. He also worked on Foley Vale Station, north of Duaringa. Paddy died at Woorabinda on 12th May 1973. Also of interest is that the aboriginal elder King Tommy is buried on a red ridge at Pearl Creek and his breast plate is in the keeping of the Duaringa Historical Society. 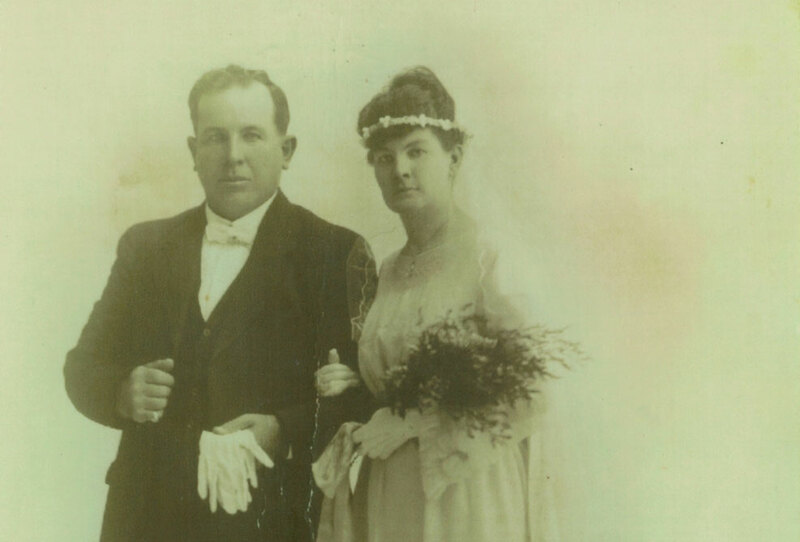 In 1956, Bruce married Joyce Margaret Draper whose family was well known and respected in the Blackwater and Duaringa areas and in 1957, Jack Walsh retired and handed management of Pearl Creek to Bruce. When building a new homestead in a preferred location to that of the Bell homestead, much of the timbers of the original house were used in its construction. Bruce then undertook to purchase the property from the existing McKenzie partnership and sold the neighbouring block – the 10,000 acre Ballynatlan. Over the years Bruce introduced Bos Indicus bloodline onto the now 24,000 acre Pearl Creek and today the herd consists entirely of quality droughtmaster cattle. 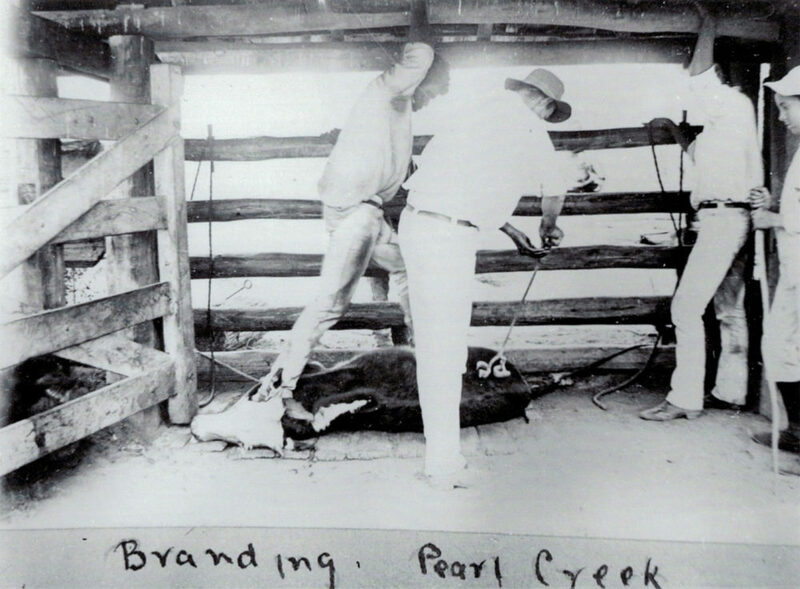 The cattle brand of Pearl Creek – 1PC – has had an interesting history. 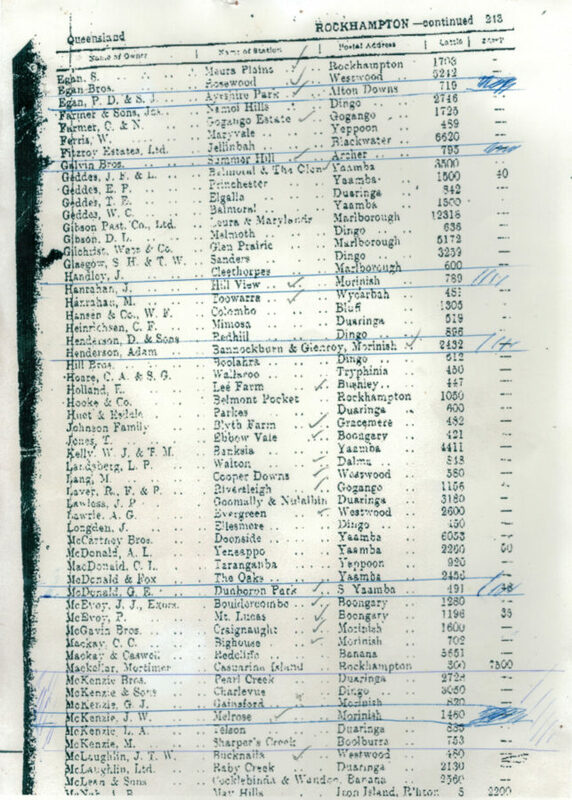 First registered on 4th July 1872 to Joseph Skelton and Ernest Eglinton of Pearl Creek, Gainsford. On 22nd December 1876 the brand was transferred to Bell & Co, Pearl Creek, Boolburra and on 15th May 1891 William Bell of Pearl Creek, took it over in his own name. Upon sale of Pearl Creek, Thomas Edward Geddes, Pearl Creek acquired the brand on 15th September 1917 and on 29th May the following year Stephen Bedford of Pearl Creek and Edward Albert Hawkins of Maaland, Bogantungan co-owned 1PC. Then on 1st October 1929 the 1PC brand returned to the owners of Pearl Creek under the registration of the McKenzie Bros. and it is still registered in the McKenzie name. Bruce and Joyce Mckenzie have three children. Julie who married and lives in Ingham, Andrew owns Wild Horse Creek, located near north of Bluff and Ken who now owns Pearl Creek with his wife Kerry and 2 sons. Ken and Kerry also own Yaralla and Brumby (previously owned by Joyce’s family) which is located at Bluff, on the eastern side at Blackwater.